In the dark dreariness of a cold northern winter in early January, what might be a good activity to pursue indoors? I had bookmarked the Spoonflower website some time ago, but didn't give it another thought until I mused that a pile of records — yes, you read that right — would make a cool pattern for a fabric. We were at a local dinner theatre for a musical performance of British rock 'n' roll, and in the lobby, they had a display of typical retro "stuff", including a pile of vinyl LPs. 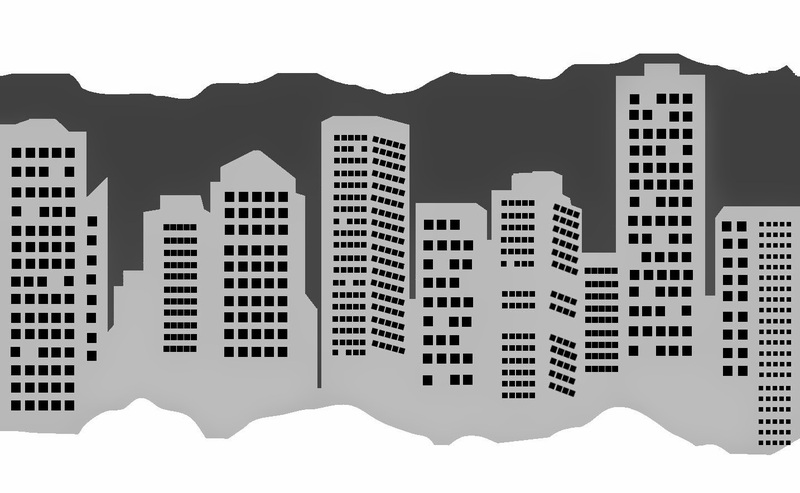 By the time I opened up a Spoonflower account a few days later, my creative mojo had swung elsewhere: firstly, to this view of my home city's skyline. While the outlines of the buildings are fairly representative, I obviously did my own thing with the window representations. I originally started with black buildings and white windows, but after reading the FAQs on Spoonflower, I figured it might be prudent to aim at a compromise. Apparently the printing technology (which is probably much like our personal inkjet printers) doesn't translate pure black very well. Over a period of three days, I went "design crazy" and came up with (over) 15 variations of fabric so that I could maximize value with the medium size sampler. (I had to tell myself to stop fiddling around with the designs so that I could get my order in!) You can tell that I didn't end up avoiding black; I decided that I needed to see for myself how it would turn out. I took the opportunity to create a couple of "eSheep Designs" fabric labels for myself with this sampler set. The 8" x 8" swatches should yield 15 of the rectangular version and 24 of the diamond logo. That should be more than enough for my needs. A combed cotton fat quarter costs $9.45 (after designer discount), so with shipping at a buck or two extra, Spoonflower actually provides a reasonably priced option for indie designers to create a small run of custom fabric labels. Fabrics of your own creation can be sold in your own Spoonflower Shop, as long as the specific design has been proofed — i.e., ordered by you — in some manner. (Ordering a sampler as described counts as "proofing".) The commission is 10%. And while it would be neat if someone eventually buys my fabric, my primary goal here is to see something that I've designed come to life in a fabric... which I can then use to make something really unique. I think it's totally awesome that this is even possible! Anyhoo, look for a continuation of this post in a few weeks, when I'll show you what I received. I haven't mesed sound with Spoonflower yet but I think the idea of it is fabulous. Someone told me they are locate here in the Carolinas? I've seen some great designs come out of Spoonflower. I like your winter in the City with the buildings and the windows. Thank you! And yes, Spoonflower is in Durham, North Carolina. I too have seen a lot of interesting fabric designs there... so impressed with what some people are able to come up with.